Thirty years ago, the term relationship marketing quietly slipped into the business lexicon. At the time marketers were grappling with the early stages of market “demassification”, forcing them to work much harder to reach a mass audience. Meanwhile the introduction of marketing automation systems promised to make addressable media a more affordable option for targeting niche segments. The principles and practices championed by the leading relationship marketing proponents of the time began to resonate with the broader marketing community. Those ideas have since become the bedrock of a new marketing model just beginning to coalesce around the idea of integrated customer management. The progression from those early years of direct and database marketing to today’s world of multi-channel real-time engagement forms a long evolutionary arc, extending from the early 1980s. Through the passage of time, technology has been the catalyst for change: from the proliferation of home PCs in the ’80s to the arrival of the web browser in the ’90s to the mass adoption of the smartphone in the past decade. While historical antecedents often reveal themselves messily, one period bleeding into another, there are at least three discernible eras in the history of relationship marketing, each marked by a technology-related tipping point, which DM Magazine has chronicled ever since it was launched in 1988. 1. The era of direct and database marketing (1989-1999). The paycheque of most marketers was still tied to the pursuit of sales. Yet mass advertising was already in slow decline, as audiences had begun to splinter due to media fragmentation. The burning question on marketers’ minds: how to make the best use of their media budgets. In their provocative book MaxiMarketing, direct marketing luminaries Stan Rapp and Tom Collins argued for more accountable marketing, principally by fostering “an ongoing relationship with the customer after the first sale by encouraging additional purchases or continued loyalty.” Five years later, in 1993, Don Peppers and Martha Rogers echoed that thinking in their best-seller, The One-to-One Future, making the concept of “one-to-one” marketing the buzzword of the decade. Their prophetic views popularized relationship marketing as a management approach. Leading academics like Jagdish Sheth contributed to the movement, giving it a scholarly anchor, supported by Fred Reichheld’s oft-quoted research showing the correlation of loyalty to profitability in The Loyalty Effect, published in 1996. By the end of the 1990s relationship marketing had gained legitimacy as a practice area, worthy of academic study. Tipping Point: marketing’s adoption of affordable customer database systems. 2. 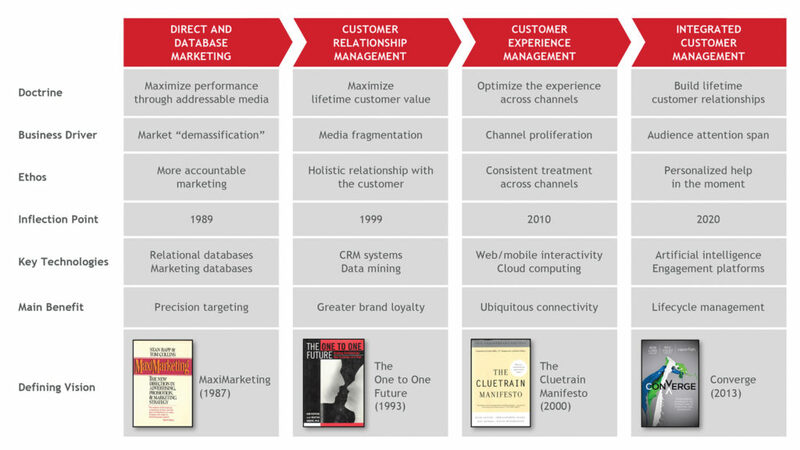 The era of customer relationship management (2000-2010). As the new millennium dawned, a rising chorus of contrarian voices could be heard, led by digital utopians, who scoffed at old school methods of brand persuasion. They called for a more consensual relationship with customers: “Permission marketing” was what Seth Godin called it. Eventually they were proven right, but initially the Internet was treated by marketers as a lower caste media channel. Meanwhile, the next generation of direct marketers had come along, schooled in the use of CRM data to segment customers, and they argued just as vigorously for more personalized marketing which addressed individual needs and preferences. Widespread use of e-mail to reach customers began to eclipse direct mail as the preferred communication channel. The convergence of CRM and web-based interactivity meant that marketers now had the tools to engage customers in a two-way dialogue. But most marketers—even those expert in CRM—had a tough time resisting the urge to push out brand messages indiscriminately. And it took a while before CRM could shake off its tarnished image from the mid-1990s, when many early system implementations failed due to a combination of inadequate systems integration, lack of process change and cultural resistance, particularly amongst sales people. Tipping Point: the transition to Web 2.0 and the Social Web. 3. The era of customer experience management (2010 – 2017). At the start of this current era most businesses struggled to keep up with the pace of digital transformation. Slow to embrace interactive marketing as a grown-up discipline, brand marketers were reluctant to yank dollars out of conventional paid media, afraid to dilute their awareness-building efforts. But the tectonic shift in customer behaviour simply could not be ignored: people no longer needed a brand to tell them what product to buy or where to find it. They just wanted a better experience. All that money spent interrupting people was seeing a diminishing return. Audiences were paying less attention, distracted by their multiple digital devices. The brand differentiator was now the ease and memorability of the customer experience. As the lights began to flicker in print publishing and broadcast media, brand-building dollars began to surge into digital media, hoping to find people willing to click. Now, as the decade draws to a close, even the most lavish ad spenders (like P&G) are pulling back, seeing “one-to-one marketing at scale” as their salvation. The Age of the Customer had officially arrived. Tipping Point: the smartphone revolution and the proliferation of digital devices. The future: integrated customer management (2018 -). Over the next few years artificial intelligence will have a climate-changing impact on marketing, helping to alleviate the burden and complexity of managing real-time interactions across multiple channels and devices. But first marketers must solve the riddle of the times: how do they encourage an open relationship with customers when the spectre of data piracy hangs over everyone? Just consider the recent Facebook data breach when 50 million profiles were hijacked. And as long as marketers are still being paid to persuade, not to befriend, they will just give lip service to the idea of relationship marketing. One thing for sure: the pace of change is about to pick up speed, pressuring all marketers to pivot toward a customer-first model. 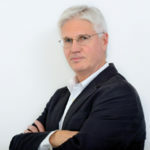 Stephen Shaw is the chief strategy officer of Kenna, a marketing solutions provider specializing in customer management. He can be reached via e-mail at sshaw@kenna.ca.